It’s on Broadway, but here in San Francisco, it’s not a traditional musical, although occasionally there are songs, perhaps you could call it “political theater” of sorts. It’s Camp Pelosi, and reviews are decidely mixed, particularly in the tony Pacific Heights enclave that is hosting the activists. Tickets are free though, if you don’t include the deadly costs of the ongoing Iraq war which prompted the group’s action. This past weekend after crossing the Golden Gate Bridge, the Code Pink group marched through the Presidio and arrived at Nancy Pelosi’s 2640 Broadway address (between Scott & Divisadero) around four o’clock in the afternoon. The group read aloud the names of all US servicemen killed in Iraq and called out for Pelosi. The intentions of Code Pink, whose most prominent nationally known members include Medea Benjamin and Cindy Sheehan, is to personally pressure Nancy Pelosi to do more about ending Bush’s botched & apparently somewhat costly Iraq War. A war whose mission was supposedly “accomplished” several years ago, yet is still ongoing and approaching it’s 4th anniversary this weekend. Since GW Bush declared the $400 billion dollar war, over 3000 thousand American servicemen have perished, and it’s estimated that well over half a million Iraqis have died. It was just this sort of info that on Monday March 12th prompted some SF Board of Supervisors members to announce their own non-binding and largely symbolic resolution that calls on Congress to “discontinue funding for ongoing military operations” and requests Congress to hold the Bush administration to account for its “total failure in Iraq.” Co-sponsored by Chris Daly, Tom Ammiano, Bevan Dufty and Ross Mirkarimi, the item was brought up during a typically dull but seemingly unrelated Budget and Finance Committee hearing. The resolution will be considered by the full Board of Supervisors at Tuesday’s regularly scheduled afternoon Board of Supervisors meeting. Over 63% of SF Voters approved a ballot measure calling for troop withdrawal from Iraq in November 2004. If you’d like to know what’s going on at Camp Pelosi , a hotline # has been provided, so call (415) 260-1120 to reach activists Leslie and Toby at the camp. 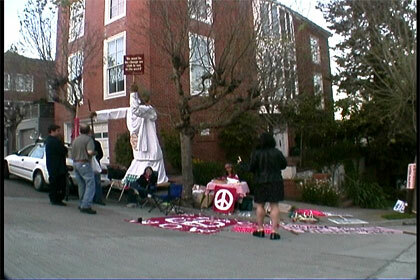 Nancy’s casa in Pacific Heights is not the only location Code Pink is hitting, on Wednesday they intend to hold a teach-in at Nancy’s office at 450 Golden Gate. For those that do not know that address, it is the Federal Bldg, and Code Pink suggests bringing a photo ID, as security is generally on high alert at that location. Bring photo ID! Y’all can meet for snacks in the 2nd floor cafeteria to receive info packets, then proceed to Nancy’s office at noon. Peace activists, families, children and all area citizens are urged to join this event on Saturday, March 17, 11 a.m., to promote the cause of peace. The march will assemble in the Walnut Creek BART parking lot, and proceed through downtown and on to Civic Park (Civic Drive and Broadway) for a rally at noon featuring speakers and music. On March 17, 2007, the 4th anniversary of the start of the criminal invasion of Iraq, tens of thousands of people from around the country will descend on the Pentagon in Washington DC . Sf’s March is the 40th anniversary of the historic 1967 anti-war march to the Pentagon during the Vietnam War. The message of the 1967 march was “From Protest to Resistance,” and marked a turning point in the development of a countrywide mass movement.